TORONTO, CANADA – Ivanhoe Mines (TSX: IVN; OTCQX: IVPAF) today announced its financial results for the year ended December 31, 2016. All figures are in U.S. dollars unless otherwise stated. Ivanhoe Mines is a Canadian mining company focused on advancing its three mine-development projects in Sub-Saharan Africa: the Platreef platinum-palladium-gold-nickel-copper discovery in South Africa; and the Kamoa-Kakula copper discovery and the Kipushi zinc-copper-lead-germanium mine in the Democratic Republic of Congo (DRC). On March 21, 2017, Ivanhoe announced that a new discovery hole had intersected a shallow, 3.8-kilometre extension of the Kakula Copper Discovery at the Kamoa-Kakula Project, in the Democratic Republic of Congo (DRC). This latest extension has been named Kakula West. The new discovery hole, DD1124, essentially doubled the presently-defined length of the copper-rich mineralized system at Kakula to more than 10 kilometres. Discovery hole DD1124 is 3.8 kilometres west of the current limit of Kakula drilling and 4.1 kilometres west of the last drill hole with returned assays – DD1093 – that was announced on January 23, 2017. DD1124 also extended the length of the Kakula mineralized trend a further six kilometres longer than the 4.1-kilometre strike length that was used to calculate the initial Kakula resource estimate in October 2016. Up to five rigs are being mobilized to Kakula West to accelerate delineation of the new discovery. On October 12, 2016, Ivanhoe released an independently verified, initial Mineral Resource estimate for the exceptionally-high-grade Kakula Discovery – the second major discovery at the Kamoa-Kakula Copper Project. Kakula's Indicated Resources presently total 192 million tonnes at a grade of 3.45% copper, containing 14.6 billion pounds of copper. Inferred Resources total 101 million tonnes at a grade of 2.74% copper, containing an additional 6.1 billion pounds of copper. Both estimates are at a 1.0% copper cut-off. At a higher 3% copper cut-off, Kakula contains Indicated Mineral Resources estimated at 66 million tonnes at 6.59% copper, plus Inferred Resources of 27 million tonnes at 5.26% copper. The combined Kamoa-Kakula Indicated Mineral Resources now total 944 million tonnes grading 2.83% copper, containing 58.9 billion pounds of copper at a 1.0% copper cut-off grade and a minimum thickness of three metres. Kamoa-Kakula also has Inferred Mineral Resources of 286 million tonnes grading 2.31% copper and containing 14.6 billion pounds of copper, also at a 1.0% copper cut-off grade and a minimum thickness of three metres. With the addition of Kakula's Mineral Resources, Wood Mackenzie – a prominent, international industry research and consulting group – independently demonstrated that the Kamoa-Kakula Project is the largest copper discovery in Zambia and the DRC, making it the largest copper discovery ever made on the African continent. In addition, Wood Mackenzie's research also shows that Kamoa-Kakula already ranks among the 10 largest copper deposits in the world. The Kakula Discovery remains open for significant expansion along trend to the west and the southeast, while the remainder of the Kakula Exploration Area remains virtually untested. Fourteen rigs now are drilling in the Kakula Exploration Area. More than 63,000 metres have been drilled since the Kakula drilling campaign began in May 2016. Ivanhoe expects to issue an updated Mineral Resource estimate for the Kakula Discovery early in Q2 2017. Nearly 200 square kilometres of the approximately 400-square-kilometre Kamoa-Kakula project area remain untested. The Kamoa-Kakula geology team, with the assistance of its technical advisors, has intensively evaluated the structural and stratigraphic controls on mineralization of the broader Kamoa-Kakula basin. This work has highlighted at least nine high-priority targets located in the untested parts of the Kamoa-Kakula project area that are planned to be drill tested this year. Kamoa Copper has retained OreWin Pty. Ltd., of Australia, to prepare a follow-up economic assessment (PEA) for the development of the Kakula and Kamoa deposits. The new PEA will assess the economic parameters ofan eight-million-tonne-per-annum (Mtpa), stand-alone Kakula Mine, plus expanded, combined mining scenarios of up to 16 Mtpa from mines at both the Kakula and the adjacent Kansoko Sud deposits. Underground mine development at Kamoa's Kansoko Mine has made good progress and is expected to reach the high-grade copper mineralization at the Kansoko Sud Deposit within the next two months. The service and conveyor declines each have been advanced more than 670 metres through underground development work. Specialist engineering firm DRA Global is finalizing the design of the Kakula box cut. Construction of the box cut is expected to begin in Q2 2017 and take approximately six months to complete. Engineering and design work of the planned twin declines at Kakula also is well advanced. In October 2016, the Kamoa-Kakula Project began drawing clean, hydroelectric power from the DRC national grid for development and construction activities. In September 2016, ongoing upgrading work financed by Ivanhoe at the Mwadingusha hydropower plant began supplying an initial 11 megawatts of electricity to thenational grid. Bench-scale metallurgical flotation test work at XPS Consulting and Testwork Services laboratories in Falconbridge, Canada, achieved copper recoveries of 87.8% and produced a concentrate with an extremely high grade of 56% copper using the flowsheet developed during the Kamoa pre-feasibility study. The material tested was a composite of chalcocite-rich Kakula drill core, assaying 8.1% copper. On February 8, 2017, Ivanhoe received the fourth of five scheduled $41.2 million installment payments from a Zijin Mining Group Co., Ltd. subsidiary as part of a strategic co-development agreement under which Zijin acquired 49.5% of Ivanhoe's majority stake in the Kamoa-Kakula copper discovery. Zijin - through its subsidiary, Gold Mountains (H.K.) International Mining Company Limited – agreed to pay a total of $412 million for the interest in Kamoa Holding Limited, beginning with an initial payment of $206 million in 2015. The fifth and final US$41.2 million installment payment from Zijin is due on May 23, 2017. Following the signing of an agreement with the DRC government in November 2016, Ivanhoe and Zijin Mining each now hold an indirect 39.6% interest in the Kamoa-Kakula Project, Crystal River Global Limited holds an indirect 0.8% interest and the DRC government holds a direct 20% interest. Kamoa Holding Limited continues to hold an 80% interest in the Kamoa-Kakula Project. A pre-feasibility study for the redevelopment of the Kipushi zinc-copper-germanium-lead-silver mine is being prepared by OreWin, of Australia. The comprehensive study will refine Ivanhoe's May 2016 preliminary economic assessment of Kipushi's proposed redevelopment. 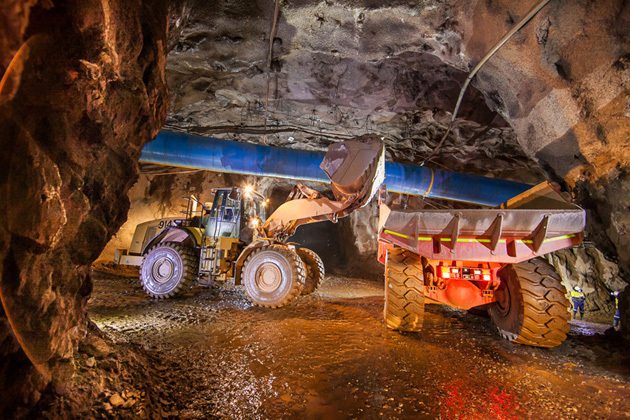 The upgraded mine is expected to produce an annual average of 530,000 tonnes of zinc concentrate over a 10-year mine life at a total cash cost, including copper by-product credits, of approximately $0.54 per pound of zinc. At the Platreef platinum-palladium-gold-nickel-copper project in South Africa, sinking of Shaft 1 has reached a depth of more than 283 metres below surface. Sinking of Shaft 1 is proceeding at an average rate of approximately 45 metres per month and is expected to reach the Flatreef Deposit, at a depth of 777 metres below surface, in the first half of 2018. Sinking will continue to a planned final depth of 980 metres below surface. Development work will include four shaft stations at depths of 450 metres, 750 metres, 850 metres and 950 metres below surface. Shaft 1 will provide development access into the Flatreef Deposit while Shaft 2 is being developed. The design has been completed for Platreef's Shaft 2, which will have a total hoisting capacity of six million tonnes per annum and an internal diameter of 10 metres. Construction of the box cut for Shaft 2 is expected to begin in Q2 2017; when completed, Shaft 2 will be the main production shaft at the Platreef Mine. On February 24, 2017, the five-million-volt-ampere power line connecting the Platreef site to the South African national grid was energized and now is supplying electricity to Platreef for shaft sinking and construction activities. The new line, a collaboration between Platreef, the South African government and local authorities, also is providing energy to the neighbouring community of Mzombane, which previously was without electricity. The feasibility study for the first phase of underground mine development at Platreef, which is being finalized by DRA Global, is expected to be completed in Q2 2017. Ivanhoe Mines' three projects achieved a combined 10.98 million work hours free of lost-time injuries (LTIF) by the end of 2016. Ivanhoe had recorded 25,973 LTIF hours at Platreef, 4.94 million hours at Kipushi and 6.01 million hours at Kamoa-Kakula to the end of 2016. The Platreef Project is owned by Ivanplats (Pty) Ltd, which is 64%-owned by Ivanhoe Mines. A 26% interest is held by Ivanplats' historically-disadvantaged broad-based, black economic empowerment (B-BBEE) partners, which include 20 local host communities with a total of approximately 150,000 people, project employees and local entrepreneurs. In January 2017, Ivanplats reconfirmed its Level 3 status in its third verification assessment on a B-BBEE scorecard. A Japanese consortium of ITOCHU Corporation and its affiliate, ITC Platinum, plus Japan Oil, Gas and Metals National Corporation and JGC Corporation, owns a 10% interest in Ivanplats, which it acquired in two tranches for a total investment of $290 million. On the Northern Limb, platinum-group metals mineralization is hosted primarily within the Platreef, a mineralized sequence that is traced more than 30 kilometres along strike. Ivanhoe's Platreef Project, within the Platreef's southern sector, is comprised of three contiguous properties: Turfspruit, Macalacaskop and Rietfontein. Turfspruit, the northernmost property, is contiguous with, and along strike from, Anglo Platinum's Mogalakwena group of mining operations and properties. Since 2007, Ivanhoe has focused its exploration and development activities on defining and advancing the down-dip extension of its original discovery at Platreef, now known as the Flatreef Deposit, which is amenable to highly mechanized, underground mining methods. The Flatreef area lies entirely on the Turfspruit and Macalacaskop properties, which form part of the company's mining right. The Platreef Project reached a total of 6,686,087 million hours worked in terms of the Mines Health and Safety Act and the Occupational Health and Safety Act (OHSA) by the end of December 2016. A Lost Time Injury (LTI) occurred to one of the shaft-sinking contract employees in December 2016. Various remedial actions have been implemented to prevent a re-occurrence. The Platreef Project continues to strive toward its workplace objective of an environment that causes zero harm to any employees, contractors, sub-contractors and consultants. Shaft 1, with an internal diameter of 7.25 metres, will provide access to the Flatreef Deposit and enable the initial underground capital development to take place during the development of Shaft 2, the main production shaft. Following the successful commissioning of the stage and kibble winders and ancillary equipment, the permanent sinking phase started in July 2016. The initial sinking phase was completed to 107 metres below surface and the main sinking phase has been initiated. Shaft 1 had reached a depth of 283 metres below surface on March 27, 2017. An average sinking rate of 45 metres per month is expected during the main sinking phase. The shaft includes a 300-millimetre concrete lining to prevent loose rock from falling into the shaft. The main sinking phase is expected to reach its projected, final depth of 980 metres below surface in 2018. Shaft stations to provide access to horizontal mine workings for personnel, materials and services will be developed at depths of 450 metres, 750 metres, 850 metres and 950 metres below surface. Figure 2. Shaft-sinking crew operating jumbo drill rigs underground in Shaft 1. 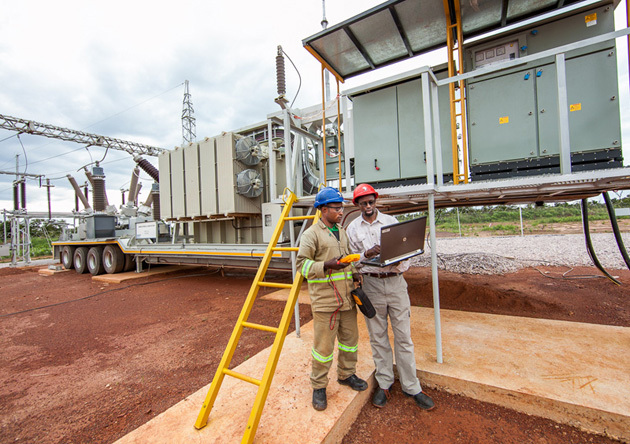 Work is complete on the Platreef electrical substation, which has a capacity of five million volt-amperes (MVA). Construction recently was completed on the power transmission lines from Eskom, South Africa's public electricity utility, which now is supplying the electricity for shaft sinking. Back-up generators have been installed to ensure continued sinking operations during any interruptions in Eskom's supply. The new transmission lines also are expected to provide power to an adjacent community near the Platreef Project, which will be a major, added community benefit. and construction activities at Platreef. Ivanhoe plans to develop the Platreef Mine in phases. The initial annual rate of four million tonnes per annum (Mtpa) is designed to establish an operating platform to support future expansions. This is expected to be followed by a potential doubling of production to eight Mtpa; and then a third expansion phase to a steady-state 12 Mtpa, which would establish Platreef among the largest platinum-group-metals mines in the world. Ivanhoe has made good progress on advancing the feasibility study of the first phase, which began in August 2015. The study is being managed by DRA Global – with specialized sub-consultants including Stantec Consulting, Murray & Roberts Cementation, SRK, Golder Associates and Digby Wells Environmental – and is expected to be completed in the first half of 2017. The selected mining areas in the current mine plan occur at depths ranging from approximately 700 metres to 1,200 metres below surface. The main access to the Flatreef Deposit and ventilation system is expected to be through four vertical shafts: 1, 2, 3 and 4. Shaft 2 will host the main personnel transport cage, material and ore-handling system; shafts 1, 3 and 4 will provide ventilation to the underground workings. Shaft 1, now under development, also will be used for initial access to the deposit and early underground development. The planned mining will incorporate low-cost, mechanized mining methods, including long-hole stoping and drift-and-fill mining. Mined-out areas will be backfilled with a mixture of tailings from the processing plant and cement. The ore will be hauled from the stopes to a series of ore passes that will connect to a main haulage level at Shaft 2, from where it will be hoisted to the surface for processing. The Olifants River Water Resource Development Project (ORWRDP) is designed to deliver water to the Eastern and Northern limbs of South Africa's Bushveld Complex. The project consists of the new De Hoop Dam, the raised wall of the Flag Boshielo Dam and related pipeline infrastructure that ultimately is expected to deliver water to Pruissen, southeast of the Northern Limb. The Pruissen Pipeline Project is expected to be developed to deliver water onward from Pruissen to the municipalities, communities and mining projects on the Northern Limb. Ivanhoe is a member of the ORWRDP's Joint Water Forum. The Platreef Project's water requirement for the first phase of development is projected to peak at approximately 10 million litres per day, which is expected to be supplied by the water network. Ivanhoe also is investigating various alternative sources of bulk water, including an allocation of bulk grey-water from a local source. The Platreef Project's electricity requirement for a four-million-tonne-per-year underground mine, concentrator and associated infrastructure has been estimated at approximately 100 million volt-amperes. An agreement has been reached with Eskom for the supply of phase-one power. Ivanhoe chose a self-build option for permanent power that will enable the company to manage the construction of the distribution lines from Eskom's Burutho sub-station to the Platreef Mine. The self-build and electrical supply agreements are being formulated. On February 2, 2017, a South African judge issued a ruling in favour of Ivanplats clearing the way for the company to proceed with the relocation of informal graves in the vicinity of its Platreef Mine development project. A total of 75 informal graves were successfully relocated from land outside the perimeter of the active mine development site to new burial plots in a formal cemetery. An additional 19 locations were investigated and found not to contain human remains. The Ivanplats support program included assistance in providing new burial plots in a formal cemetery, tombstones and related services. Ivanplats plans to relocate an estimated 27 additional informal graves as part of the second phase of its relocation program after the permits for the exhumations and reburials have been received. Further phases on peripheral infrastructure areas also are planned. The relocation of informal graves will not impact on the development of the Platreef Project. 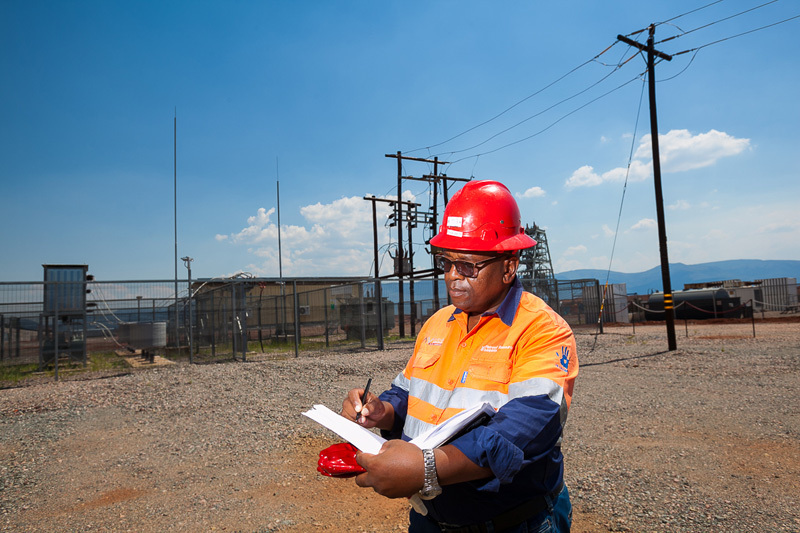 Work is progressing well on the implementation of Ivanhoe's Social and Labour Plan (SLP), to which the company has pledged a total of R160 million ($11 million) during the first five years, culminating in November 2019. The approved plan includes R67 million ($4 million) for the development of job skills among local residents and R88 million ($6 million) for local economic development projects. The Kipushi Project achieved a total of 4,943,935 work hours free of lost-time injuries, equivalent to 1,604 days, to the end of 2016. Malaria remains the most frequently occurring health concern at Kipushi with approximately 200 cases reported in 2016 – an average of approximately 17 cases per month. In an effort to reduce the incidence of malaria in the Kipushi community, a Water Sanitation and Health (WASH) program has been initiated in cooperation with the Territorial Administrator and the local community. The main emphasis of the program's first phase is cleaning storm drains in the municipality to prevent accumulations of ponded water, where malarial mosquitos breed. The Fionet program to improve malaria diagnostics and treatment expanded to 300 Deki readers installed in 252 medical service providers in Haut-Katanga and Lualaba provinces in Southern DRC, which host Ivanhoe's Kipushi and Kamoa-Kakula Projects. Deki readers provide automated readings of rapid diagnostic tests to remove the human-error factor and avoid prescription of unnecessary medication. The data is uploaded to a cloud server for analysis by the Ministry of Health in planning malaria-control measures. There were more than 30,000 patient encounters, where Deki readers provided diagnostic testing, during the past year, with approximately 63% of patients testing negative for malaria. Road and drainage rehabilitation on the main thoroughfare through the centre of Kipushi municipality was completed by the Haut-Katanga Office of Roads and Drainage (Office des Voires et Drainage) following the civil works completed by MCK on behalf of the Kipushi Project. The Kipushi Mine, which had been placed on care and maintenance in 1993, flooded in early 2011 due to a lack of pump maintenance over an extended period. At its peak, water reached 851 metres below the surface. 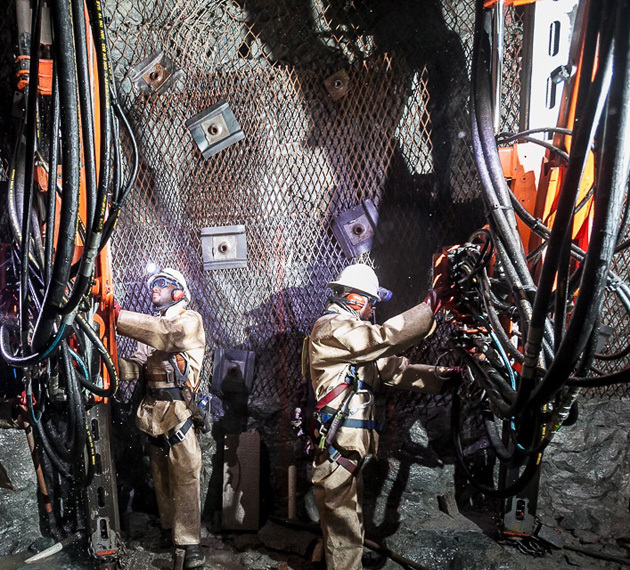 Ivanhoe restored access to the mine's principal haulage level at 1,150 metres below surface in December 2013; since then, crews have been upgrading underground infrastructure to permanently stabilize the water levels. Since completion of the drilling program, water levels have been lowered to the bottom of Shaft 5, which is planned to be the mine's main production shaft. The shaft is eight metres in diameter, 1,240 metres deep and approximately 1.5 kilometres from the planned main mining area. It provides the primary access to the lower levels of the mine, including the Big Zinc Deposit, through the 1,150-metre haulage level and underground ramp decline. Engineering work has focused on the upgrading of Shaft 5 conveyances and infrastructure, cleaning the shaft bottom to facilitate the installation of new hoist ropes, repairs and upgrades to the hoisting infrastructure and cleaning and stripping of the main pump station at the 1,200-metre-level. 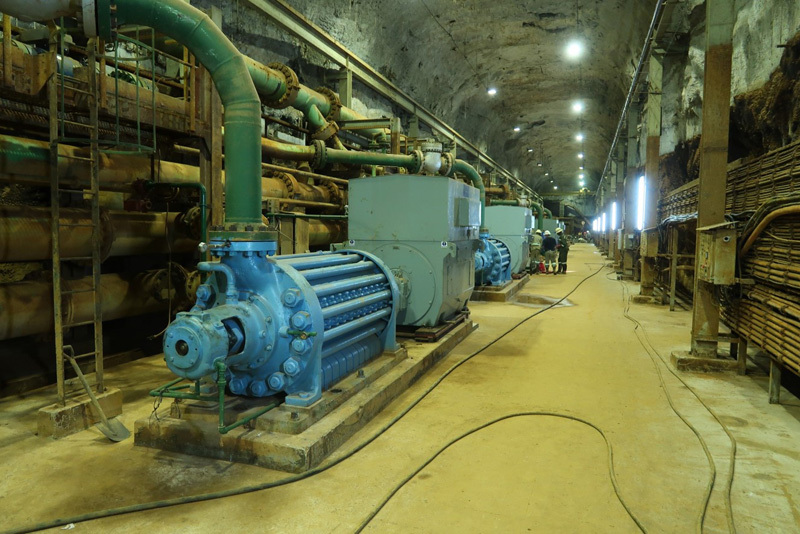 A new, high-volume ventilation fan also has been installed and commissioned on surface at Shaft 4 to provide fresh air to the underground workings. Figure 4. New high-capacity water pumps at Kipushi's 1,200-metre level. In September 2016, Ivanhoe began a pre-feasibility study (PFS) on the Kipushi Project that will further refine the optimal development scenario for the existing underground mine at Kipushi. Orewin, of Australia, has been appointed the main engineering firm for the preparation of the PFS. Golder Associates, MDM, SRK, DRA, Murray & Roberts and Grindrod also have been engaged to complete various aspects of the study. The PFS will refine the positive preliminary economic assessment (PEA) for the redevelopment of the Kipushi Project that was announced on May 2, 2016. The PEA was prepared in compliance with Canadian National Instrument 43-101 – Standards of Disclosure for Mineral Projects. 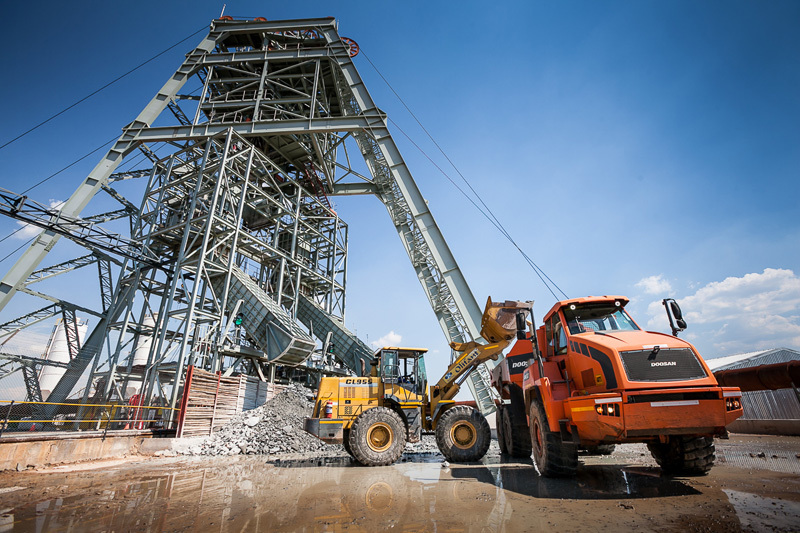 Life-of-mine average planned zinc concentrate production of 530,000 dry tonnes per annum – with a concentrate grade of 53% zinc – is expected to rank Kipushi, once in production, among the world's major zinc mines. Ivanhoe sold a 49.5% share interest in Kamoa Holding Limited to Zijin Mining in December 2015 for an aggregate consideration of $412 million. In addition, Ivanhoe sold a 1% share interest in Kamoa Holding to privately-owned Crystal River Global Limited for $8.32 million – which Crystal River will pay through a non-interest-bearing, 10-year promissory note. Since the conclusion of the Zijin transaction in December 2015, each shareholder has been required to fund expenditures at the Kamoa-Kakula Project in an amount equivalent to its proportionate shareholding interest in Kamoa Holding. A 5%, non-dilutable interest in the Kamoa-Kakula Project was transferred to the DRC government on September 11, 2012, for no consideration, pursuant to the DRC Mining Code. Following the signing of an agreement with the DRC government in November 2016, in which an additional 15% interest in the Kamoa-Kakula Project was transferred to the DRC government, Ivanhoe and Zijin Mining now each hold an indirect 39.6% interest in the Kamoa-Kakula Project, Crystal River Global Limited holds an indirect 0.8% interest and the DRC government holds a direct 20% interest. Kamoa Holding Limited continues to hold an 80% interest in the project. 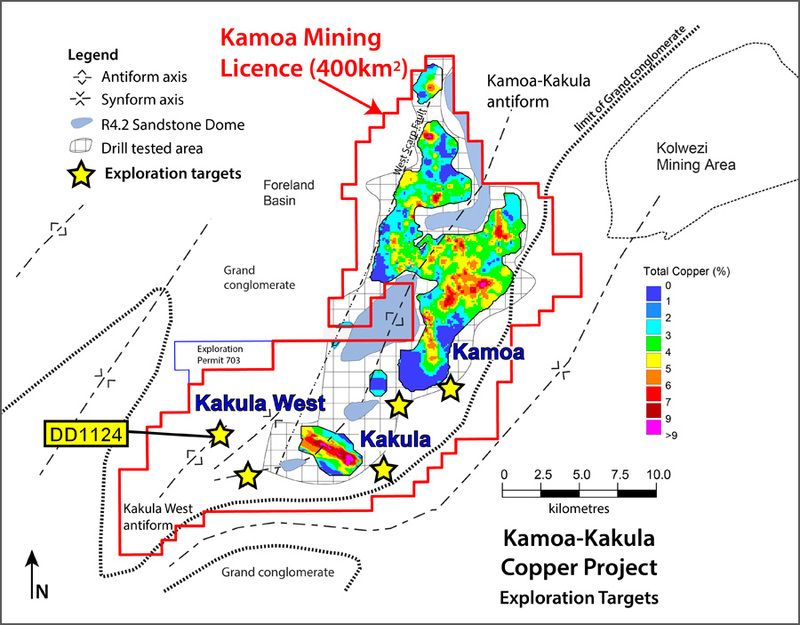 On March 21, 2017, Ivanhoe announced that a new step-out hole – drilled 5.4 kilometres west of the present boundary of Kakula's current Inferred Resources – intersected a relatively shallow, 16.3-metre zone of typical Kakula-style, chalcocite-rich copper mineralization similar to holes drilled in the centre of the high-grade Kakula Deposit on the Kamoa-Kakula Copper Project. 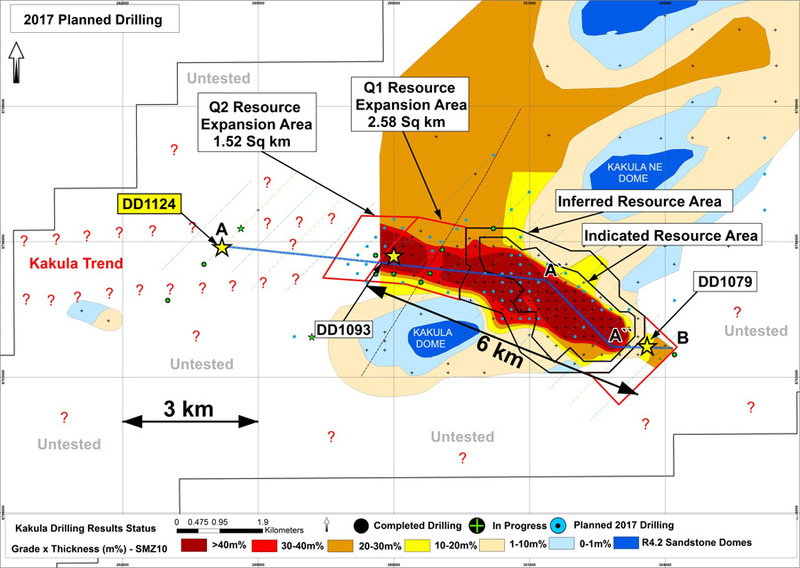 The DD1124 discovery hole is 3.8 kilometres west of the current limit of Kakula drilling and 4.1 kilometres west of the last drill hole with returned assays – DD1093 – that was announced on January 23, 2017. The target area where DD1124 was drilled – now named Kakula West – was selected by the Kamoa-Kakula geological team at the intersection of the axis of the interpreted Kakula trend with a southwesterly-northeasterly-trending antiform (the Kakula West antiform). DD1124 intersected 16.3 metres of visually moderate-strong chalcocite copper mineralization, similar to the mineralization encountered within the core of the chalcocite-rich Kakula Deposit, beginning at a downhole depth of 422.2 metres (410 metres below surface), which included a 4.0-metre zone of strong-to-very-strong mineralization beginning at a downhole depth of 432.4 metres. Assays for DD1124 are expected early next month. Up to five rigs are being mobilized to fast-track the drilling at the Kakula West discovery. Hole DD1124 has extended the length of the Kakula mineralized trend to approximately 10.1 kilometres, essentially doubling the previously estimated strike length of 5.5 kilometres contained in Ivanhoe's January 23, 2017 news release. The continuing success also means that the discovery has grown to become six kilometres longer than the deposit's 4.1-kilometre strike length that was used in calculating the initial Kakula resource estimate in October 2016. The Kakula Discovery remains open along a westerly-southeasterly strike. Importantly, the chalcocite-rich zone of mineralization in DD1124 was intersected at a depth of approximately 400 metres below surface, significantly shallower than several of the mineralized intercepts announced in January 2017 that were drilled closer to the western boundary of the Kakula Inferred Resource (See Figure 7). and composites at a 2.5% copper cut-off. Ivanhoe issued an updated Mineral Resource for the Kamoa-Kakula Project on October 12, 2016. The updated Mineral Resource included the initial Kakula Mineral Resource estimate, prepared by Ivanhoe Mines under the direction of Amec Foster Wheeler E&C Services Inc., of Reno, USA, in accordance with the 2014 CIM Definition Standards for Mineral Resources and Mineral Reserves. The Qualified Persons for the Kamoa-Kakula Mineral Resource estimate are Dr. Harry Parker, RM, SME and Gordon Seibel, RM, SME both of Amec Foster Wheeler E&C Services Inc. The combined Kamoa-Kakula Project's Indicated Mineral Resources now total 944 million tonnes grading 2.83% copper, containing 58.9 billion pounds of copper at a 1.0% copper cut-off grade and a minimum thickness of three metres. Kamoa-Kakula now also has Inferred Mineral Resources of 286 million tonnes grading 2.31% copper and containing 14.6 billion pounds of copper, also at a 1.0% copper cut-off grade and a minimum thickness of three metres. The Kakula Indicated Mineral Resources total 192 million tonnes at a grade of 3.45% copper, containing 14.6 billion pounds of copper at a 1% copper cut-off. At a 2% copper cut-off, Indicated Resources total 115 million tonnes at a 4.80% copper grade, containing 12.1 billion pounds of copper. At a higher cut-off of 3% copper, Indicated Resources total 66 million tonnes at a grade of 6.59% copper, containing 9.6 billion pounds of copper. Kakula has Inferred Mineral Resources totalling 101 million tonnes at a grade of 2.74% copper, containing 6.1 billion pounds of copper at a 1% copper cut-off. At a 2% copper cut-off, Inferred Resources total 51 million tonnes at a 3.92% copper grade, containing 4.4 billion pounds of copper. At a higher cut-off of 3% copper, Inferred Resources total 27 million tonnes at a grade of 5.26% copper, containing 3.2 billion pounds of copper. Kakula's Indicated and Inferred resources are included in the combined Kamoa-Kakula Project resources. The average true thickness of the Kakula selective mineralized zone (SMZ) at a 1% cut-off is 14.27 metres in the Indicated Resources area and 10.33 metres in the Inferred Resources area. At a higher 3% cut-off, the average true thickness of the SMZ is 5.91 metres in the Indicated Resources area and 5.15 metres in the Inferred Resources area. On December 13, 2016, Ivanhoe Mines announced the results of a positive, independent, preliminary economic assessment of initial options for the start-up of world-scale copper mining on the Kakula and Kamoa deposits. The PEA presented two initial development scenarios for the Kamoa-Kakula Project. One initial option analyzed in the PEA is the development of a four-million-tonne-per-annum (Mtpa) Kakula Phase 1 Mine at the Kakula Deposit, in the southerly portion of the project's discovery area. For this option, the PEA envisaged an average annual production rate of 216,000 tonnes of copper at a mine-site cash cost of $0.37/lb copper for the first 10 years of operations and peak copper production of 262,000 tonnes by year three. A pre-production capital cost of $1.0 billion for this option would result in an after-tax net present value at an 8% discount rate (NPV8%) of $3.7 billion with an after-tax internal rate of return (IRR) of 38%. The PEA also analyzed an alternative initial option that could involve a two-phase, sequential expansion of production to eight Mtpa from the proposed Kakula Phase 1 Mine at the Kakula Deposit and also the Kansoko Mine at the adjacent Kamoa Deposit. Under this alternative, the PEA envisaged $1.0 billion in capital costs and an average annual production rate of 292,000 tonnes of copper at a mine-site cash cost of $0.42/lb copper during the first 10 years of operations and peak production of 370,000 tonnes by year seven. This would result in an after-tax NPV8% of $4.7 billion, an after-tax IRR of 34.6% and payback period of 3.5 years. Health and safety remain key priorities for all people working at the Kamoa-Kakula Project. A noteworthy milestone of six million hours worked without a lost-time injury was achieved at the project on December 29, 2016. During Q4 2016, a total of 13,508 metres of exploration drilling was completed at the new Kakula Discovery. A further 11,678 metres were completed by the drilling contractor, Titan Drilling SARL, utilizing up to six drill rigs; an additional 1,831 metres were completed using company-owned drill rigs. Included in the drilling program were holes drilled for geotechnical studies to help find a suitable location for the Kakula box cut. Exploration drilling for 2016 totalled 45,853 metres. A decision was made at the end of Q4 2016 to increase exploration diamond drilling activity into 2017. The intention is to accelerate the resource expansion drilling planned for Q1 and Q2 2017 to establish sufficient resource for an expansion of the four Mpta production plan option examined in the December 13, 2016, PEA. The PEA examined two possible development options for the Kakula Deposit, and the Kakula Deposit together with the adjacent Kamoa Deposit. A total of nine rigs now are dedicated to the resource expansion drilling program. The current plan is to update the Mineral Resource in early Q2 2017. Geological investigations of the untested parts of the Kamoa-Kakula licence are ongoing and a number of significant targets have been identified. Five rigs now are dedicated to drill testing regional targets on the Kamoa-Kakula licence, including Kakula West, bringing the total number of rigs active at Kamoa-Kakula to 14. Locations of the delineated resources, drill-tested areas and targets for future exploration are shown in Figure 5. In July 2016, initial metallurgical test results from a sample of exploration drill core from the Kakula area achieved copper recoveries of 86% and produced a copper concentrate with a grade of 53% copper. Due to high-grade intercepts consistently achieved at Kakula, an additional sample of higher grade was selected and shipped to the XPS laboratories for preliminary floatation tests. DD1012 and DD1036 composite grading 8.1% copper produced a recovery of 87.8% at an extremely high concentrate grade of 56% copper. These positive preliminary Kakula metallurgical test results indicate that the metallurgy is very similar to that at Kansoko Sud and Centrale, and that mineralization from these three areas could be successfully processed through the same concentrator plant. A metallurgical drilling campaign for a representative composite sample is planned for Q2 2017 for PFS circuit development and optimization in line with the defined Kakula resource. Earlier metallurgical testwork indicated that the Kamoa and Kakula concentrates contain extremely low arsenic levels, by world standards – approximately 0.02%. Given this critical competitive marketing advantage, Kamoa-Kakula concentrates are expected to attract a significant premium from copper-concentrate traders for use in blending with concentrates from other mines. The concentrates will help to enable the other concentrates to meet the limit of 0.5% arsenic imposed by Chinese smelters to meet China's environmental restrictions. Byrnecut Underground Congo SARL progressed well with the decline development at Kansoko Sud during Q4 2016. The service and conveyor declines each have been advanced more than 670 metres through underground development work. Development of the underground mine is designed to reach the high-grade copper mineralization at the Kansoko Sud Deposit during Q2 2017. Copper Project's high-grade Kansoko Mine. The Kamoa-Kakula technical team has identified a location for a box cut for the initial portal to planned decline ramps that will provide underground access to the Kakula Deposit. The design of the box cut has been completed and the excavation, support and civil works have been tendered. Bids have been received and adjudicated and Kamoa-Kakula now is in a position to award the work. Construction of the Kakula box cut is expected to take approximately six months, after which development of the set of twin declines can commence. A tender document is under preparation for the Kakula decline development and is expected to be issued to prospective contractors in April 2017. The construction of the 120 kilovolt (kV) power line that branches off from the main supply at Kisenge has been completed. A 120kV mobile substation was installed, commissioned and energized on October 30, 2016. The Kamoa mine site now is connected to the national electrical grid and is receiving hydropower for work on site. An eight-kilometre, 11kV overhead power line with mini substations has been constructed from the mine site to the Kamoa camp and is supplying hydropower from the mine to the camp. The supply of electricity from the grid has resulted in significant savings from reduced use of diesel fuel. power to develop the access declines for the planned mine. The Mwadingusha Unit 1 repair work was completed in August 2016 and the official inauguration ceremony was held at the Mwadingusha power station on September 7. The Mwadingusha G1 unit, supplying 11 megawatts, was synchronized to the SNEL national interconnected grid on September 6. Preparations for permanent power progressed well during Q4 2016. The contract to purchase four turbines for the Mwadingusha power plant upgrades was awarded and the contract signed between SNEL and the consortium Andritz Hydro & CEGELEC. A site visit by the consortium took place in December in preparation for demolition work to start in August 2017. The number of unskilled job opportunities from the Kamoa-Kakula Project and contractors has risen during Q4 2016 due to the increase in activity around the camp and mine area. Preference is given to local job-seekers and numerous positions have been filled. aquaculture production that is reducing the cost of fish for the Kamoa-Kakula Project and empowering involved communities through nutrition enhancement and economic growth. Community projects in 2016 also included the construction of a secondary school at the local Kaponda village. The company recorded a total comprehensive loss of $35.8 million for the year ending December 31, 2016, compared to a total comprehensive profit of $668.3 million for the year ending December 31, 2015. The profit in 2015 was attributable mainly to the gain on the partial sale of Kamoa Holding of $357.7 million and the re-measurement to fair value of the interest retained in the joint venture of $376.1 million. In 2015, the company sold a 50.5% stake in Kamoa Holding, the company that owned 95% of the Kamoa-Kakula Project. The company sold a 49.5% stake to Gold Mountains (H.K.) International Mining Company Limited, a subsidiary of Zijin Mining Group Co., Ltd. (Zijin), for an aggregate consideration of $412 million. Zijin paid an initial $206 million at closing in December 2015, followed by the payment of the first three of five scheduled $41.2 million installments in March, July and October 2016 and the fourth installment in February 2017. The fifth and final $41.2 million installment payment is due on May 23, 2017. In addition, the company sold 1% of its share interest to Crystal River Global Limited. Crystal River paid its purchase consideration of $8.32 million through a non-interest-bearing, 10-year promissory note. The present value of the purchase consideration at the closing date, net of transaction costs, amounted to $390.4 million. As a result of the partial sale, the company derecognized the assets, liabilities and non-controlling interest of Kamoa Holding, recognized the investment retained at its fair value, deemed to be $408.2 million at the time. This resulted in the gain associated with the sale of $357.7 million and the re-measurement to fair value of the interest retained in the joint venture of $376.1 million. Subsequent to the partial sale, the company accounted for Kamoa Holding as a joint venture using the equity method of accounting. 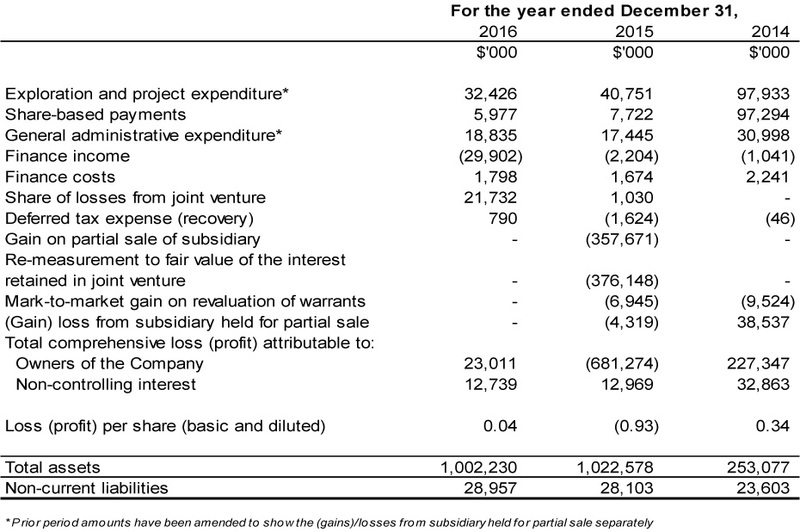 When excluding the 2015 gain on the partial sale of Kamoa Holding of $357.7 million and the re-measurement to fair value of the interest retained in the joint venture of $376.1 million, the company's total comprehensive loss for the year ending December 31, 2015, amounted to $65.5 million. This is $29.7 million higher than the total comprehensive loss for the same period in 2016 of $35.8 million. The decrease mainly was due to exchange gains on translation of foreign operations of $10.2 million recognized in 2016 compared to an exchange loss on translation of foreign operations of $20.7 million in 2015, as well as the company's share of losses from the Kamoa Holding joint venture that increased from $1.0 million in 2015 to $21.7 million in 2016. The increase in finance income of $27.7 million, together with an $8.3 million decrease in exploration and project expenditure, also contributed to the decreased comprehensive loss for the period, but was partly offset by the company's mark-to-market gain on revaluation of warrants of $6.9 million that expired during December 2015. Finance income for the year ending December 31, 2016, amounted to $29.9 million, and was $27.7 million more than for the same period in 2015 ($2.2 million). 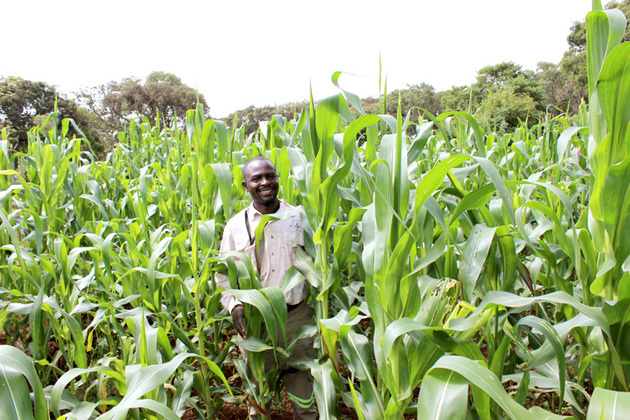 The increase mainly was due to interest earned on loans to the Kamoa Holding joint venture that amounted to $16.2 million in 2016, together with deemed finance income on the purchase price receivable from the partial sale of the Kamoa-Kakula Project, of $11.0 million. The costs associated with mine development are capitalized as development costs in Kamoa Holding, while the exploration expenditure at Kakula is expensed. The interest expense in the Kamoa Holding joint venture relates to shareholder loans where each shareholder is required to fund Kamoa Holding in an amount equivalent to its proportionate shareholding interest. Exploration and project expenditures for the year ending December 31, 2016, amounted to $32.4 million and were $8.4 million less than for the same period in 2015 ($40.8 million). The $4.1 million retrenchment costs incurred in 2015 relating to the closure of Ivanhoe's regional exploration company in the DRC was the main reason for the decrease, together with reduced expenditure at the Kipushi Project. With the focus at the Platreef Project on development and the Kamoa-Kakula Project being accounted for as a joint venture, $31.7 million of the total $32.4 million exploration and project expenditure related to the Kipushi Project. Expenditure at the Kipushi Project decreased by $2.0 million compared to the same period in 2015. The company's total assets decreased by $20.3 million, from $1,022.6 million as at December 31, 2015, to $1,002.2 million as at December 31, 2016. This resulted from the company utilizing its cash resources in its operations. The company's total liabilities increased by $2.2 million to $46.0 million as at December 31, 2016, from $43.8 million as at December 31, 2015. The remaining purchase price receivable due to the company as a result of the sale of 49.5% of Kamoa Holding decreased as the company received $134.3 million from Zijin during 2016. The present value of the remaining consideration receivable, net of transaction costs, was $76.2 million as at December 31, 2016. Ivanhoe received $41.2 million of the remaining consideration receivable subsequent to December 31, 2016, on February 8, 2017, and the last installment is due on May 23, 2017. The company's investment in the Kamoa Holding joint venture increased by $61.6 million from $412.0 as at December 31, 2015, to $473.6 million as at December 31, 2016, with the current shareholders funding the operations equivalent to their proportionate shareholding interest. The company's portion of the Kamoa Holding joint venture cash calls amounted to $58.4 million during 2016, while the company's share of comprehensive loss from joint venture amounted to $21.7 million. At Kamoa-Kakula, the focus remained on development, together with an exploration program at the Kakula Discovery. Property, plant and equipment increased by $48.4 million, with a total of $43.5 million being spent on project development and to acquire other property, plant and equipment, $40.3 million of which pertained to development costs of the Platreef Project. The company utilized $31.0 million of its cash resources in its operations and earned interest income of $2.7 million in 2016. The company had $285.0 million in cash and cash equivalents as at December 31, 2016. Certain of the company's cash and cash equivalents, having an aggregate value of $19.8 million, are subject to contractual restrictions as to their use and are reserved for the Platreef Project. 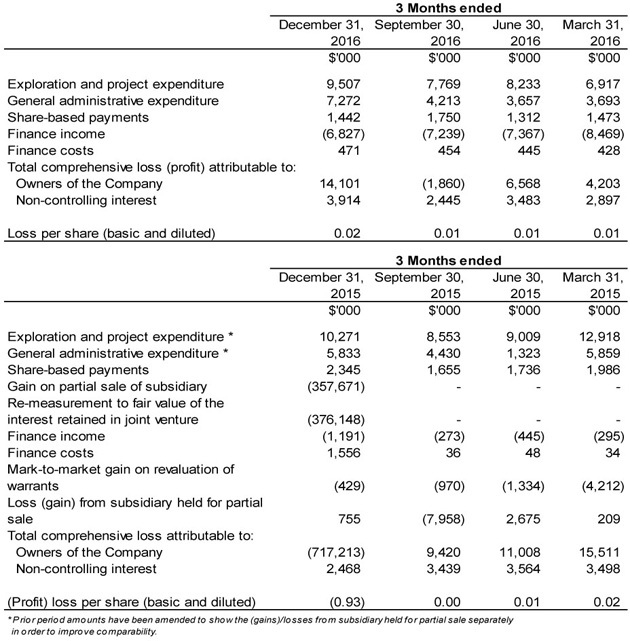 As at December 31, 2016, the company had consolidated working capital of approximately $364.8 million, compared to $424.6 million at December 31, 2015. The Platreef Project working capital is restricted and amounted to $14.8 million at December 31, 2016, and $53.2 million at December 31, 2015. Excluding the Platreef Project working capital, the resultant working capital was $350.0 million at December 31, 2016, and $371.4 million at December 31, 2015. The company believes it has sufficient resources to cover its short-term cash requirements. However, the company's access to financing always is uncertain and there can be no assurance that additional funding will be available to the company in the near future. On December 8, 2015, Zijin, through a subsidiary company, acquired a 49.5% interest in Kamoa Holding for a total of $412 million in a series of payments. Ivanhoe received an initial $206 million from Zijin on December 8, 2015, and a further $41.2 million on each of March 23, 2016, July 8, 2016, October 25, 2016, and February 8, 2017; the last remaining $41.2 million is scheduled to be received on May 23, 2017. Since December 8, 2015, each shareholder in Kamoa Holding has been required to fund Kamoa Holding in an amount equivalent to its proportionate shareholding interest. The company's main objectives for 2017 at the Platreef Project are the completion of the phase one feasibility study, the continuation of Shaft 1 construction and commencement of construction of Shaft 2. At Kipushi, the principal objective is the completion of the pre-feasibility study and continued upgrading of mining infrastructure. At the Kamoa-Kakula Project, priorities are the continuation of drilling, the continuation of construction of the twin declines at Kamoa and the commencement of a box cut at Kakula. The company expects to spend $60 million on further development at the Platreef Project; $33 million at the Kipushi Project; and $15 million on corporate overheads in 2017 – as well as its proportionate funding of the Kamoa-Kakula Project, expected to be $55 million for 2017. This news release should be read in conjunction with Ivanhoe Mines' audited 2016 Financial Statements and Management's Discussion and Analysis report available at www.ivanhoemines.com and at www.sedar.com. Technical Report dated March 11, 2016 prepared by MSA Group (Pty) Ltd and OreWin covering the company's Kipushi Project. Certain statements in this news release constitute "forward-looking statements" or "forward-looking information" within the meaning of applicable securities laws. Such statements and information involve known and unknown risks, uncertainties and other factors that may cause the actual results, performance or achievements of the company, its projects, or industry results, to be materially different from any future results, performance or achievements expressed or implied by such forward-looking statements or information. Such statements can be identified by the use of words such as "may", "would", "could", "will", "intend", "expect", "believe", "plan", "anticipate", "estimate", "scheduled", "forecast", "predict" and other similar terminology, or state that certain actions, events or results "may", "could", "would", "might" or "will" be taken, occur or be achieved. These statements reflect the company's current expectations regarding future events, performance and results and speak only as of the date of this news release. Such statements include without limitation, the timing and results of: (i) statements regarding Shaft 1 providing initial access for early underground development at the Flatreef Deposit; (ii) statements regarding the station development of Shaft 1 at the 450, 750, 850 and 950-metre levels; (iii) statements regarding the sinking of Shaft 1, including that a sinking rate of 45 metres per month is expected; (iv) statements regarding Shaft 1 reaching the planned, final depth at 980 metres below surface in 2018; (v) statements regarding the timing of the commencement of Shaft 2 development, including that construction is to commence in 2017; (vi) statements regarding the operational and technical capacity of Shaft 1; (vii) statements regarding the internal diameter and hoisting capacity of Shaft 2; (viii) statements regarding the company's plans to develop the Platreef Mine in three phases: an initial annual rate of four million tonnes per annum (Mtpa) to establish an operating platform to support future expansions; followed by a doubling of production to eight Mtpa; and then a third expansion phase to a steady-state 12 Mtpa; (ix) statements regarding the planned underground mining methods of the Platreef Project including long-hole stoping and drift-and-fill mining; (x) statements regarding the expectation to start the construction of the Platreef Project's box cut for Shaft 2 in Q2 2017; (xi) statements regarding peak water use of 10 million litres per day at the Platreef Project and development of the Pruissen Pipeline Project; (xii) statements regarding the Platreef Project's estimated electricity requirement of 100 million volt-amperes; (xiii) statements regarding the completion of a feasibility study at the Platreef Project in the first half of 2017; (xiv) statements regarding the declines having been designed to intersect the high-grade copper mineralization in the Kansoko Sud area during the first quarter of 2017; (xv) statements regarding the timing, size and objectives of drilling and other exploration programs for 2017 and future periods including a metallurgical drilling campaign at the Kakula deposit planned for the second quarter of 2017 and increased exploration diamond drilling activity in 2017; (xvi) statements regarding the implementation of Social and Labour Plan at the Platreef Project and pledged expenditure of R160 million; (xvii) statements regarding the expectation to have an updated mineral resource for the Kakula Discovery released in early Q2; (xviii) statements that the Kakula box cut is expected to take approximately six months; and (xix) statements regarding expected expenditure in 2017 of $60 million on further development at the Platreef Project; $33 million at the Kipushi Project; and $15 million on corporate overheads – as well as its proportionate funding of the Kamoa-Kakula Project, expected to be $55 million in 2017. As well, all of the results of the pre-feasibility study of the Kamoa-Kakula Project and preliminary economic assessment of development options for the Kakula deposit, the pre-feasibility study of the Platreef Project and the preliminary economic assessment of the Kipushi Project constitute forward-looking statements or information, and include future estimates of internal rates of return, net present value, future production, estimates of cash cost, proposed mining plans and methods, mine life estimates, cash flow forecasts, metal recoveries, estimates of capital and operating costs and the size and timing of phased development of the projects. Furthermore, with respect to this specific forward-looking information concerning the development of the Kamoa-Kakula, Platreef and Kipushi Projects, the company has based its assumptions and analysis on certain factors that are inherently uncertain. Uncertainties include: (i) the adequacy of infrastructure; (ii) geological characteristics; (iii) metallurgical characteristics of the mineralization; (iv) the ability to develop adequate processing capacity; (v) the price of copper, nickel, zinc, platinum, palladium, rhodium and gold; (vi) the availability of equipment and facilities necessary to complete development; (vii) the cost of consumables and mining and processing equipment; (viii) unforeseen technological and engineering problems; (ix) accidents or acts of sabotage or terrorism; (x) currency fluctuations; (xi) changes in regulations; (xii) the compliance by joint venture partners with terms of agreements, (xiii) the availability and productivity of skilled labour; (xiv) the regulation of the mining industry by various governmental agencies; and (xv) political factors. This news release also contains references to estimates of Mineral Resources and Mineral Reserves. The estimation of Mineral Resources is inherently uncertain and involves subjective judgments about many relevant factors. Estimates of Mineral Reserves provide more certainty but still involve similar subjective judgements. Mineral Resources that are not Mineral Reserves do not have demonstrated economic viability. The accuracy of any such estimates is a function of the quantity and quality of available data, and of the assumptions made and judgments used in engineering and geological interpretation (including estimated future production from the company's projects, the anticipated tonnages and grades that will be mined and the estimated level of recovery that will be realized), which may prove to be unreliable and depend, to a certain extent, upon the analysis of drilling results and statistical inferences that ultimately may prove to be inaccurate. Mineral Resource or Mineral Reserve estimates may have to be re-estimated based on: (i) fluctuations in copper, nickel, zinc, platinum group elements (PGE), gold or other mineral prices; (ii) results of drilling; (iii) metallurgical testing and other studies; (iv) proposed mining operations, including dilution; (v) the evaluation of mine plans subsequent to the date of any estimates and/or changes in mine plans; (vi) the possible failure to receive required permits, approvals and licenses; and (vii) changes in law or regulation. The company's actual results could differ materially from those anticipated in these forward-looking statements as a result of the factors set forth in the "Risk Factors" section and elsewhere in the company's MD&A.